First off, you can visit our Free Weed Page. At WeedSuck, we focus all of our efforts on finding the easiest and cheapest way to get marijuana into the consumers hands. Whether that means pointing you to a nearby dispensary or exposing you to the growing business of weed delivery. It is our goal to get you to smoke weed for free. A goal we take very seriously. The easiest way to get free weed is to focus on the quickly growing industry of Weed Delivery. Weed dispensaries are great, but they already have a large number of loyal customers and aren’t as inclined to give away free marijuana. This isn’t true for Weed Delivery, a brand new industry that is growing up all over the West Coast. Weed Delivery blossomed from the concept of Uber delivery and the convenient timing of loosened marijuana laws. These companies know that not everyone has the time or desire to fight traffic to go to a local dispensary. They also know that because the Federal government still considers Weed illegal, it is impossible to ship it. This has created a lucrative market, and a bunch of companies rushing to fill the space. EazeUp and GreenRush are two of the largest of these companies. Each fighting to gain control of the market over the other. When WeedSuck first started offering promo codes, Eaze and GreenRush both only offered $20 off your first order. As the two began seriously competing that number began to grow. Now Eaze offers $60 off your order while GreenRush offers an amazing $80! Their competition allows you to smoke weed for free! Don’t just stop with those two companies, be sure to try out the other Weed delivery companies. Meadow, Nugg, Kushfly all have their own discount programs that get you at least $20 off your first order. I tell everyone I talk to that they should make sure to try out all of these services at least once, it will save you hundreds of dollars off your medical marijuana. 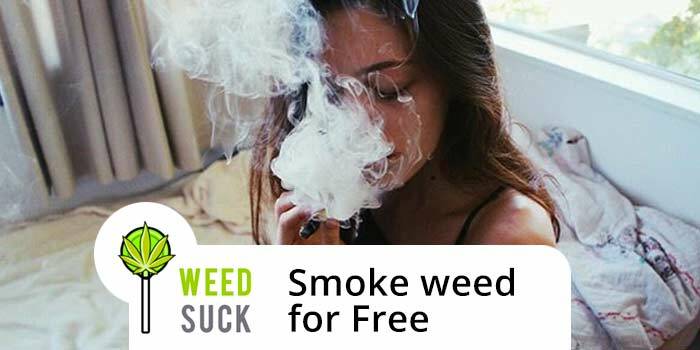 Check back with WeedSuck as we find you more ways to smoke weed for free. For those who are more ambitious, be sure to look out for our DIY home weed growing kit tutorial coming soon!